A-7D Corsairs in a disruptive pattern, countershaded with white, on a disruptively painted surface, Thailand, 1972. Military camouflage is part of the art of military deception. The main objective of military camouflage is to deceive the enemy as to the presence, position and intentions of military formations. Camouflage techniques include concealment, disguise, and dummies, applied to troops, vehicles, and positions. Vision is the main sense of orientation in humans, and the primary function of camouflage is to deceive the human eye. Camouflage works through concealment (whether by countershading, preventing casting shadows, or disruption of outlines), mimicry, or possibly by dazzle. In modern warfare, some forms of camouflage, for example face paints, also offer concealment from infrared sensors, while CADPAT textiles in addition help to provide concealment from radar. A Ferret armoured car with "Berlin camouflage" meant to hide it against that city's concrete buildings. Such terrain specific patterns are rare. While camouflage tricks are in principle limitless, both cost and practical considerations limit the choice of methods and the time and effort devoted to camouflage. Paint and uniforms must also protect vehicles and soldiers from the elements. Units need to move, fire their weapons and perform other tasks to keep functional, some of which run counter to camouflage. Camouflage may be dropped altogether. Late in the Second World War, the USAAF abandoned camouflage paint for some aircraft to lure enemy fighters to attack, while in the Cold War, some aircraft similarly flew with polished metal skins, to reduce drag and weight, or to reduce vulnerability to radiation from nuclear weapons. No single camouflage pattern is effective in all terrains. The effectiveness of a pattern depends on contrast as well as colour tones. Strong contrasts which disrupt outlines are better suited for environments such as forests where the play of light and shade is prominent, while low contrasts are better suited to open terrain with little shading structure. Patterns made to match the local terrain may be more effective in that terrain than more general patterns. However, unlike an animal or a civilian hunter, military units may need to cross several terrain types like woodland, farmland and built up areas in a single day. While civilian hunting clothing may have almost photo-realistic depictions of tree bark or leaves (indeed, some such patterns are based on photographs), military camouflage is designed to work in a range of environments. With the cost of uniforms in particular being substantial, most armies operating globally have two separate full uniforms, one for woodland/jungle and one for desert and other dry terrain. An American attempt at a global camouflage pattern for all environments (the 2004 UCP) was however withdrawn after a few years of service. On the other end of the scale are terrain specific patterns like the "Berlin camo", applied to British vehicles operating in Berlin during the Cold War, where square fields of various gray shades was designed to hide vehicles against the mostly concrete architecture of post-war Berlin. Seasons may play a role in some regions. A dramatic change in colour and texture is created by seasonal snowy conditions in northern latitudes, necessitating repainting of vehicles and separate snow oversuits. The Eastern and northern European countries have a tradition for separate winter uniforms rather than oversuits. During the Second World War, the Waffen-SS went a step further, developing reversible uniforms with separate schemes for summer and autumn, as well as white winter oversuits. 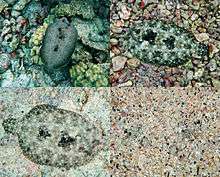 While patterns can provide more effective crypsis than solid colour when the camouflaged object is stationary, any pattern, particularly one with high contrast, stands out when the object is moving. Jungle camouflage uniforms were issued during the Second World War, but both the British and American forces found that a simple green uniform provided better camouflage when soldiers were moving. After the war, most nations returned to a unicoloured uniform for their troops. Some nations, notably Austria and Israel, continue to use solid colour combat uniforms today. Similarly, while larger military aircraft traditionally had a disruptive pattern with a darker top over a lighter lower surface (a form of countershading), modern fast fighter aircraft often wear gray overall. The Canadian Forces were the first army to issue pixellated digital camouflage for all units with their disruptively patterned CADPAT. Digital camouflage provides a disruptive effect through the use of pixellated patterns at a range of scales, meaning that the camouflage helps to defeat observation at a range of distances. Such patterns were first developed during the Second World War, when Johann Georg Otto Schick designed a number of patterns for the Waffen-SS, combining micro- and macro-patterns in one scheme. The German Army developed the idea further in the 1970s into Flecktarn, which combines smaller shapes with dithering; this softens the edges of the large scale pattern, making the underlying objects harder to discern. Pixellated shapes pre-date computer aided design by many years, already being used in Soviet Union experiments with camouflage patterns, such as "TTsMKK"[lower-alpha 1] developed in 1944 or 1945. In the 1970s, US Army officer Timothy R. O'Neill suggested that patterns consisting of square blocks of colour would provide effective camouflage. By 2000, O'Neill's idea was combined with patterns like the German Flecktarn to create pixellated patterns such as CADPAT and MARPAT. Battledress in digital camouflage patterns was first designed by the Canadian Forces. The "digital" refers to the coordinates of the pattern, which are digitally defined. The term is also used of computer generated patterns like the non-pixellated Multicam and the Italian fractal Vegetato pattern. Pixellation does not in itself contribute to the camouflaging effect. The pixellated style, however, simplifies design and eases printing on fabric. With the birth of radar and sonar and other means of detecting military hardware not depending on the human eye, came means of camouflaging against them. Collectively these are known as stealth technology. Aircraft and ships can be shaped to reflect radar impulses away from the sender, and covered with radar-absorbing materials, to reduce their radar signature. The use of heat-seeking missiles has also led to efforts to hide the heat signature of aircraft engines. Methods include exhaust ports shaped to mix hot exhaust gases with cold surrounding air, and placing the exhaust ports on the upper side of the airframe. Multi-spectral camouflage attempts to hide objects from detection methods such as infra-red, radar, and millimetre-wave imaging simultaneously. Auditory camouflage, at least in the form of noise reduction, is practised in various ways. The rubberized hull of military submarines absorbs sonar waves and can be seen as a form of auditory camouflage. Some modern helicopters are designed to be quiet. Combat uniforms are usually equipped with buttons rather than snap fasteners or velcro to reduce noise. Olfactory camouflage is said to be rare; examples include ghillie suits, special garments for military snipers made from strips of hessian cloth, which are sometimes treated with mud and even manure to give them an "earthy" smell to cover the smell of the sniper. Magnetic camouflage in the form of "degaussing" coils has been used since the Second World War to protect ships from magnetic mines and other weapons with magnetic sensors. Horizontal coils around the whole or parts of the ship generate magnetic fields to "cancel out" distortions to the earth's magnetic field created by the ship. Ship camouflage was occasionally used in ancient times. Vegetius wrote in the 4th century that "Venetian blue" (bluish-green, like the sea) was used for camouflage in the years 56–54 BC during the Gallic Wars, when Julius Caesar sent his scout ships to gather intelligence along the coast of Britain. The bluish-green scout ships carried sailors and marines dressed in the same colour. Green is without comparison the best colour for light troops with dark accouterments; and if put on in the spring, by autumn it nearly fades with the leaves, preserving its characteristic of being scarcely discernible at a distance. The tradition was continued by British Rifle Regiments who adopted rifle green for the Napoleonic Wars. During the Peninsular War, Portugal fielded light infantry units known as Caçadores, who wore brown-jackets which helped conceal them. The brown color was considered to be more adequate for a concealment in the landscape of most of Portuguese regions, in general more arid than the greener landscapes of Central and Northern Europe. Other nations soon followed suit, dressing their rifle regiments and sometimes also light troops in suitable drab tones, usually variations of green or gray. The first introduction of drab general uniform was by the British Corps of Guides in India in 1848. Initially the drab uniform was specially imported from England, with one of the reasons being to "make them invisible in a land of dust". However, when a larger quantity was required the army improvised, using a local dye to produce uniform locally. This type of drab uniform soon became known as khaki (Urdu for dusty, soil-coloured) by the Indian soldiers, and was of a similar colour to a local dress of cotton coloured with the mazari palm. The example was followed by other British units during the mutiny of 1857, dying their white drill uniforms to inconspicuous tones with mud, tea, coffee or coloured inks. The resulting hue varied from dark or slate grey through light brown to off-white, or sometimes even lavender. This improvised measure gradually became widespread among the troops stationed in India and North-West Frontier, and sometimes among the troops campaigning on the African continent. 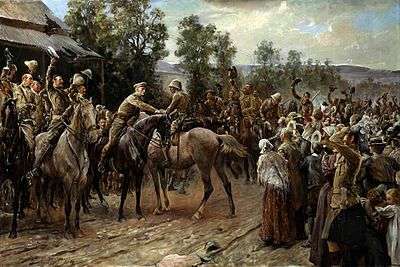 The Relief of Ladysmith by John Henry Frederick Bacon shows the khaki uniforms used by the British in the Second Boer War. While long range rifles became the standard weapon in the 1830s, armies were slow to adapt their tactics and uniforms, perhaps as a result of mainly fighting colonial wars against less well armed opponents. Not until the First Boer War of 1880/81 did a major European power meet an opponent well equipped with and well versed in the use of modern long range repeating firearms, forcing an immediate change in tactics and uniforms. Khaki-coloured uniform became standard service dress for both British and British Indian Army troops stationed in British India in 1885, and in 1896 khaki drill uniform was adopted by British Army for the service outside of Europe in general, but not until the Second Boer War, in 1902, did the entire British Army standardise on khaki (officially known as "drab") for Service Dress. The US military, who had green-jacketed rifle units in the Civil War, were quick to follow the British, going khaki in the same year. Russia followed, partially, in 1908. The Italian Army used grigio-verde ("grey-green") in the Alps from 1906 and across the army from 1909. The Germans adopted feldgrau ("field grey") in 1910. By the outbreak of the First World War in 1914, France was the only major power to still field soldiers dressed in traditional conspicuous uniforms. The First World War was the first full scale industrial conflict fought with modern firearms. The casualty rate on the Western Front forced the French to finally relinquish their blue coats and red trousers, adopting a grayish "horizon blue" uniform. The use of rapid firing machine guns and long range breech loading artillery quickly led to camouflaging of vehicles and positions. Artillery pieces were soon painted in contrasting bold colours to obscure their outlines. Another early trend was building observation trees, made of steel with bark camouflage. Such trees became popular with the British and French armies in 1916. The observation tree was invented by French painter Lucien-Victor Guirand de Scévola, who led the French army's camouflage unit, the first of its kind in any army. He also invented painted canvas netting to hide machine gun positions, and this was quickly taken up for hiding equipment and gun positions from 1917, 7 million square yards being used by the end of the war. The First World War also saw the birth of aerial warfare, and with it the need not only to conceal positions and vehicles from being spotted from the air, but also the need to camouflage the aircraft themselves. In 1917, Germany started using a lozenge camouflage covering Central Powers aircraft, possibly the earliest printed camouflage. A similarly disruptive splinter pattern in earth tones, Buntfarbenanstrich 1918, was introduced for tanks in 1918, and was also used on the Stahlhelm (steel helmet), becoming the first use of a standardized camouflage pattern for soldiers. In 1909 an American artist and amateur zoologist, Abbott Thayer published a book, Concealing-Coloration in the Animal Kingdom, which was widely read by military leaders, though his advocacy of countershading was unsuccessful, despite his patent for countershading submarines and surface ships. The earliest camouflage artists were members of the Post- Impressionist and Fauve schools of France. Contemporary artistic movements such as cubism, vorticism and impressionism also influenced the development of camouflage as they dealt with disrupting outlines, abstraction and colour theory. The French established a Section de Camouflage (Camouflage Department) at Amiens in 1915, headed by Lucien-Victor Guirand de Scévola. His camoufleurs included the artists Jacques Villon, André Dunoyer de Segonzac, Charles Camoin and André Mare. Camouflage schemes of the First World War and Interwar periods that employed dazzle patterns were often described as "cubist" by commentators, and Picasso claimed with typical hyperbole "Yes, it is we who made it, that is cubism". Most of the artists employed as camoufleurs were traditional representative painters, not cubists, but de Scévola claimed "In order to deform totally the aspect of the object, I had to employ the means that cubists use to represent it." Other countries soon saw the advantage of camouflage, and established their own units of artists, designers and architects. The British established a Camouflage Section in late 1916 at Wimereux, and the U.S. followed suit with the New York Camouflage Society in April 1917, the official Company A of 40th Engineers in January 1918 and the Women's Reserve Camouflage Corps. The Italians set up the Laboratorio di mascheramento in 1917. By 1918 de Scévola was in command of camouflage workshops with over 9,000 workers, not counting the camoufleurs working at the front itself. Printed camouflage for shelter halves was introduced for the Italian and German armies in the interwar period, the "splotchy" M1929 Telo mimetico in Italy and the angular Splittermuster 31 in Germany. During the War, both patterns were used for paratrooper uniforms for their respective countries. The British soon followed suit with a brush-stroke type pattern for their paratrooper's Denison smock, and the Soviets introduced an "amoeba" pattern overgarment for their snipers. The principle is one with many applications to modern warfare. In the Great War it was utilized by the Germans when they introduced strongly marked incidents of white or black tone to conceal the fainter contrasts of tone made by the sloping sides of overhead camouflage-screens, or roofing, as seen from the air. The same principle has, of course, a special application in any attempt to reduce the visibility of large objects of all kinds, such as ships, tanks, buildings, and aerodromes. Both British and Soviet aircraft were given wave-type camouflage paintwork for their upper surfaces throughout the war, while American ones remained simple two-colour schemes (different upper and under sides) or even dispensed with camouflage altogether. Italian and some Japanese aircraft wore sprayed-on spotted patterns. German aircraft mostly used an angular splint-pattern camouflage, but Germany experimented with different schemes, particularly in the later stages of the war. They also experimented with various spray-on camouflage patterns for tanks and other vehicles, while Allied vehicles remained largely uni-coloured. The British Middle East Command Camouflage Directorate, consisting mainly of artists recruited into the Royal Engineers, developed the use of camouflage for large-scale military deception. Operations combined the disguise of actual installations, vehicles and stores with the simultaneous display of dummies, whether to draw fire or to give a false idea of the strength of forces or likely attack directions. 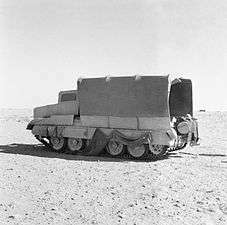 In Operation Bertram for the decisive battle at El Alamein, a whole dummy armoured division was constructed, while real tanks were disguised as soft-skinned transport using "Sunshield" covers. The capabilities so developed were put to use not only in the western desert, but also in Europe as in the Operation Bodyguard deception for the Invasion of Normandy, and in the Pacific campaign, as in the Battle of Goodenough Island. The introduction of strategic bombing led to efforts to camouflage airfields and strategic production centres. These forms of position camouflages could be quite elaborate, and even include false houses and cars. With the threat from nuclear weapons in the post-war era such elaborate camouflage was no longer seen as useful, as a direct hit would not be necessary with strategic nuclear weapons to destroy infrastructure. The Soviet Union's military doctrine of maskirovka (literally: disguise, camouflage, concealment) defines the need for surprise through deception, including camouflage, based on experiences such as the Battle of Kursk where camouflage helped the Red Army to overwhelm a powerful enemy. The role of uniform is not only to hide each soldier, but also to identify friend from foe. Issue of the "Frogskin" uniforms to US troops in Europe during the Second World War was halted as it was too often mistaken for the disruptively patterned German uniform worn by the Waffen-SS. Camouflage uniforms need to be made and distributed to a large number of soldiers. The design of camouflage uniforms therefore involves a tradeoff between camouflaging effect, recognizability, cost, and manufacturability. Armies facing service in different theatres may need several different camouflage uniforms. Separate issues of temperate/jungle and desert camouflage uniforms are common. Patterns can to some extent be adapted to different terrains by adding means of fastening pieces of vegetation to the uniform. Helmets often have netting covers; some jackets have small loops for the same purpose. Being able to find appropriate camouflage vegetation or in other ways modify the issued battle uniform to suit the local terrain is an important skill for infantry soldiers. Countries in boreal climates often need snow camouflage, either by having reversible uniforms or simple overgarments. Such simple overgarments can be used for other terrains too. The Austrian and Israeli armies use solid colour field uniforms, relying on simple overgarments for camouflage. An M901 with MERDC winter verdant camouflage scheme. The purpose of vehicle and equipment camouflage differs from personal camouflage in that the primary threat is aerial reconnaissance. The goal is to disrupt the characteristic shape of the vehicle, to reduce shine, and to make the vehicle difficult to identify even if it is spotted. Paint is the least effective measure, but forms a basis for other techniques. Military vehicles often become so dirty that pattern-painted camouflage is not visible, and although matt colours reduce shine, a wet vehicle can still be shiny, especially when viewed from above. Patterns are designed to make it more difficult to interpret shadows and shapes. The British Army adopted a disruptive scheme for vehicles operating in the stony desert of the North African Campaign and Greece, retrospectively known as the Caunter scheme. It used up to six colours applied with straight lines. The British Army's Special Air Service used pink as the primary colour on its desert-camouflaged Land Rover Series IIA patrol vehicles, nicknamed Pink Panthers; the colour had been observed to be indistinguishable from sand at a distance. Nets can be effective at defeating visual observation. Traditional camouflage nets use a textile 'garnish' to generate an apparent texture with a depth of shadow created beneath it, and the effect can be reinforced with pieces of vegetation. Modern nets tend to be made of a continuous woven material, which is easier to deploy over a vehicle and lack the "windows" between patches of garnish of traditional nets. Some nets can remain in place while vehicles move. Simple nets are less effective in defeating radar and thermal sensors. 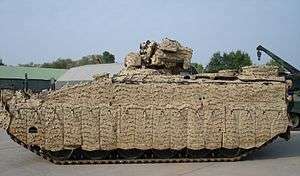 Heavier, more durable "mobile camouflage systems", essentially conformal duvets with thermal and radar properties, provide a degree of concealment without the delay caused by having to spread nets around a vehicle. Until the 20th century, naval weapons had a short range, so camouflage was unimportant for ships, and for the men on board them. Paint schemes were selected on the basis of ease of maintenance or aesthetics, typically buff upperworks (with polished brass fittings) and white or black hulls. Around the start of the 20th century, the increasing range of naval engagements, as demonstrated by the Battle of Tsushima, prompted the introduction of the first camouflage, in the form of some solid shade of gray overall, in the hope that ships would fade into the mist. First and Second World War dazzle camouflage, pioneered by English artist Norman Wilkinson, was used not to make ships disappear, but to make them seem smaller and/or faster, to encourage misidentification by an enemy and to make the ships harder to hit. After the Second World War, the use of radar made camouflage generally less effective. However, camouflage may have helped to protect US warships from Vietnamese shore batteries using optical rangefinders. 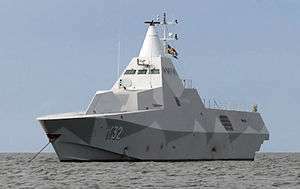 Coastal patrol boats such as those of the Norwegian, Swedish and Indonesian navies continue to use terrestrial style disruptively patterned camouflage. Other camouflage schemes acknowledge that aircraft may be seen at any angle and against any background while in combat, so aircraft are painted all over with a disruptive pattern or a neutral colour such as gray. Maritime patrol Catalina is painted white, but even so parts of it appear dark against the sky. 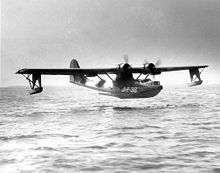 Second World War maritime patrol aircraft such as the Consolidated PBY Catalina flying boat were painted white, as aircraft generally appear dark against the sky (including at night), and hence are least visible when painted in as light a colour as possible. The problem of appearing dark against the sky was explored in the U.S. Navy's Yehudi lights project in 1943, using counter-illumination to raise the average brightness of a plane, when seen head-on, from a dark shape to the same as the sky. The experiments worked, enabling an aircraft to approach to within 2 miles (3.2 km) before being seen, whereas aircraft without the lights were noticed 12 miles (19 km) away. The higher speeds of modern aircraft, and the reliance on radar and missiles in air combat have reduced the value of visual camouflage, while increasing the value of electronic "stealth" measures. Modern paint is designed to absorb electromagnetic radiation used by radar, reducing the signature of the aircraft, and to limit the emission of infrared light used by heat seeking missiles to detect their target. Further advances in aircraft camouflage are being investigated in the field of active camouflage. Postcard of costumes at the 'Dazzle Ball' held by the Chelsea Arts Club, 1919, a peacetime reaction to war. Fashion and the "Dazzle Ball"
The scheme of decoration for the great fancy dress ball given by the Chelsea Arts Club at the Albert Hall, the other day, was based on the principles of 'Dazzle', the method of 'camouflage' used during the war in the painting of ships ... The total effect was brilliant and fantastic. 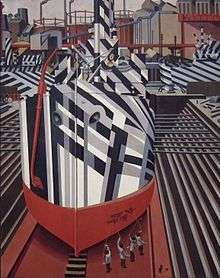 Edward Wadsworth: Dazzle-ships in dry dock at Liverpool, 1919, National Gallery of Canada, Ottawa. While many artists helped to develop camouflage during and since World War I, the disparate sympathies of the two cultures restrained the use of "militaristic" forms other than in the work of war artists. Since the 1960s, several artists have exploited the symbolism of camouflage. For example, Andy Warhol's 1986 camouflage series was his last major work, including Camouflage Self-Portrait. Alain Jacquet created many camouflage works from 1961 to the 1970s. Alighiero Boetti's 1966/67 work "Mimetico" (camouflage) was simply a section of the pioneering Italian telo mimetico camouflage fabric on a frame, as part of his Arte Povera program. Ian Hamilton Finlay's 1973 Arcadia was a screenprint of a leafily-camouflaged tank, "an ironic parallel between this idea of a natural paradise and the camouflage patterns on a tank", as the Tate Collection describes it. Veruschka, the pseudonym of Vera von Lehndorff and Holger Trülzsch, created "Nature, Signs & Animals" and "Mimicry-Dress-Art" in 1970–73. Thomas Hirschhorn made Utopia : One World, One War, One Army, One Dress in 2005. In the US in the 1960s, military clothing became increasingly common (mostly olive drab rather than patterned camouflage); it was often found worn by anti-war protestors, initially within groups such as Vietnam Veterans Against the War but then increasingly widely as a symbol of political protest. Fashion often uses camouflage as inspiration - attracted by the striking designs, the "patterned disorder" of camouflage, its symbolism (to be celebrated or subverted [vide its use by Hello Kitty]), and its versatility. Early designers include Marimekko (1960s), Jean-Charles de Castelbajac (1975-), Stephen Sprouse (using Warhol prints, 1987–1988), and Franco Moschino (1986), but it was not until the 1990s that camouflage became a significant and widespread facet of dress from streetwear to high-fashion labels - especially the use of "faux-camouflage". Producers using camouflage in the 1990s and beyond include: John Galliano for Christian Dior, Marc Jacobs for Louis Vuitton, Comme des Garçons, Chanel, Tommy Hilfiger, Dolce & Gabbana, Issey Miyake, Armani, Yves Saint-Laurent. Companies closely associated with camouflage patterns include 6876, A Bathing Ape, Stone Island, Stüssy, Maharishi, mhi, Zoo York, Addict, and Girbaud, using and overprinting genuine military surplus fabric; others use camouflage patterns in bright colours such as pink or purple. Some, such as Emma Lundgren and Stüssy, have created their own designs or integrated camouflage patterns with other symbols. Some countries such as Barbados, Aruba, and other Caribbean nations have laws prohibiting camouflage clothing from being worn by non-military personnel, including tourists and children. Civilian possession of camouflage is still banned in Zimbabwe. ↑ TTsMKK is short for "TryokhTsvetniy Maskirovochniy Kamuflirovanniy Kombinezon", three colour disguise camouflage overalls. ↑ The dark above, light below camouflage pattern is often called countershading, but its function is not, to flatten out shadow as in Thayer's law, but to camouflage against two different backgrounds. ↑ Newark, 2007. p. 8. 1 2 3 4 5 6 7 8 9 Brayley, 2009. ↑ Newark, 2007. p. 160. ↑ "Camouflage Face Paints". GlobalSecurity.org. Retrieved 26 September 2016. 1 2 3 Richardson, 2001. 1 2 US Army, 2013. ↑ US War Department, 2013. ↑ Shabbir, Usman. "Highlights from IDEAS 2002". ACIG Special Reports. Air Combat Information Group. Retrieved 30 April 2013. ↑ A US 4287243 A, Nielsen, Willi G., "Mat for multispectral camouflage of objects and permanent constructions", published 1 September 1981 . ↑ Haythornthwaite, 2002. p 20. ↑ Barthorp, 1988. Volume 3, pp 24–37. ↑ Barthorp, 1988. Volume 4, pages 24–33. ↑ The Encyclopaedia Britannica. 30 (11 ed.). 1922. p. 541. 1 2 3 4 Stroud, 2012. ↑ Casey, 1951. pp. 138–140. ↑ Glantz, 1989. p. 6 and passim. ↑ Clark, 2011. p. 278. 1 2 War Department, 1944. ↑ Cott, 1940. pp. 104–111. ↑ Cott, 1940. p. 48. 1 2 Forbes, 2009, page 100. ↑ "'DJ Squila',sustained serious head injuries". The Zimbabwean. 2008-10-30. Retrieved 2014-11-08. Antique Photos. "German steel helmets". Antique Photos. Retrieved 2 October 2012. BBC (21 January 2006). "Degaussing Ships in Falmouth Docks". BBC. Retrieved 22 January 2013. Blücher (2013). "Camouflage Net: Multispectral Camouflage Systems". BLÜCHER SYSTEMS. Retrieved 1 January 2013. "Alighiero Boetti, "Mimetico", 1967". Museo Madre. Retrieved 9 October 2012. Boucher, W. Ira. "An Illustrated History of World War One". German Lozenge Camouflage. Retrieved 2 November 2009. Cabela's. "Camo Pattern Buyer's Guide". Cabela's Canada. Retrieved 24 September 2012. Casey, Hugh J., ed. (1951). Airfield and Base Development. Engineers of the Southwest Pacific. Washington, D.C.: United States Government Printing Office. "Israel". Camopedia. 27 March 2011. Retrieved 26 January 2013. Casson, Lionel (1995). Ships and Seamanship in the Ancient World. JHU Press. p. 235. ISBN 0-8018-5130-0. Chappell, M (2003). The British Army in World War I (1). Osprey. p. 37. Chartrand, René. "Miscellaneous Notes on Rangers". Military Heritage. Retrieved 8 January 2013. Craemer, Guy (2007). "CADPAT or MARPAT Camouflage". Who did it first; Canada or the US?. Hyperstealth. Retrieved 3 February 2012. Craemer, Guy. "Dual Texture - U.S. Army digital camouflage". United Dynamics Corp. Retrieved 27 September 2012. Crowdy, Terry (2007). Military Misdemeanors. p. 149. ISBN 978-1-84603-148-9. Danton, Louis (1915). "Cubisme et camouflage - L'Histoire par l'image". histoire-image.org (in French). Retrieved 18 August 2012. Davies, W. "Berlin Brigade Urban Paint Scheme". Newsletter. Ex-Military Land Rover Association. Retrieved 25 September 2012. Dillon, Ronan (24 February 2011). "Protesters in Camouflage". The Re-Appropriation of Camouflage from military use into civilian clothing. This Greedy Pig.com. Retrieved 1 December 2011. Douglass, Steve; Sweetman, Bill (May 1997). "Hiding in Plane Sight: Stealth aircraft own the night. Now they want the day". Popular Science: 54–59. Retrieved 1 November 2009. Engber, D. (5 July 2012). "Lost in the Wilderness, the military's misadventures in pixellated camouflage". State. Retrieved 27 September 2012. FAS (12 December 1998). "Degaussing". FAS. Retrieved 22 January 2013. Freedberg Jr., S.J. (25 June 2012). "Army Drops Universal Camouflage After Spending Billions". Aol Defence. Retrieved 27 September 2012. Galliano (9 September – 16 December 2006). "Love and War: The Weaponized Woman". John Galliano for Christian Dior, silk camouflage evening dress. The Museum at FIT. Retrieved 1 December 2011. GlobalSecurity. "Stealth Helicopter: MH-X Advanced Special Operations Helicopter". GlobalSecurity.org. Retrieved 28 April 2012. Greer (1980). Dana Bell; illustrated by Don, eds. Air Force colors. Carrollton, Texas: Squadron/Signal Publications. ISBN 0-89747-108-3. Grimes, William (9 September 2008). "New York Times". Alain Jacquet, Playful Pop Artist, Dies at 69. New York Times. Retrieved 1 December 2011. Harris, Tom. "How Stealth Bombers Work". How Stuff Works. Retrieved 22 January 2013. Katz, Sam; Ronald Volstad (1988). Israeli Elite Units since 1948. United Kingdom: Osprey publishing. p. 64. ISBN 978-0-85045-837-4. Kitsune. "Norwegian Skjold class Surface Effect Patrol Boat". Retrieved 26 January 2013. Krone. "Signature management: passive protection". Krone Technology. Retrieved 1 January 2013. Lehndorff, Vera; Trülzsch, Holger. "Vera Lehndorff & Holger Trülzsch". (Portfolio of photographs). Veruschka.net. Retrieved 1 December 2011. Letowski, T.R. (2012). Owning the Environment: Stealth Soldier— Research Outline. Aberdeen Proving Ground, MD: U.S. Army Research Laboratory. p. 20. Lundgren, Emma. "Emma Lundgren: Camouflage". Camouflage (fashion). emmalundgren.com. Retrieved 1 December 2011. Massimello, Giovanni; Apostolo, Giorgio (2000). Italian aces of World War 2 (1. publ. ed.). Oxford: Osprey. ISBN 1-84176-078-1. Peterson, D. (2001). Waffen-SS Camouflage Uniforms and Post-war Derivatives. Crowood. p. 64. ISBN 978-1-86126-474-9. Prinzeugen. "Schnellboot: An Illustrated Technical History". Prinz Eugen. Retrieved 5 March 2012. SAS. "Mobility Troop - SAS Land Rovers". Retrieved 8 January 2013. Showalter, Dennis E. (2004). Tannenberg:clash of empires 1914. p. 148. ISBN 1-57488-781-5. Strikehold (2010). "Making Sense of Digital Camouflage". Strikehold. Retrieved 2 September 2012. Stüssy. "Stüssy Camo". Camouflage (fashion). stussy.com. Retrieved 25 July 2012. Summers, Chris (10 June 2004). "Stealth ships steam ahead". BBC News. Retrieved 27 May 2010. Sumner, Graham (2003). Roman Military Clothing: AD 200–400. 2. Osprey Publishing. p. 24. ISBN 1-84176-559-7. Tanchelev, Gloria (10 March – 13 May 2006). "Thomas Hirschhorn". Feature: Reviews: Thomas Hirschhorn: UTOPIA UTOPIA = ONE WORLD ONE WAR ONE ARMY ONE DRESS. Stretcher.org. Retrieved 1 December 2011. Tate (July 2008). "Ian Hamilton Finlay 1925–2006: Arcadia". Arcadia, 1973. Tate Collection. Retrieved 1 December 2011. Turner, Brad (2004–2010). "1944/45 3-colour deceptive camouflage pattern (TTsMKK)". Kamouflage.net. Retrieved 24 January 2013. * Turner, B. "Bundeswehr Flecktarn, Federal Republic of Germany". Camouflage.net. Retrieved 28 September 2012. Turner, B. "1938 amoeba pattern, green base". Kamouflage.net. Retrieved 28 September 2012. US Army (2009). Photosimulation Camouflage Detection Test. Natick, MA: U.S. Army Natick Soldier Research, Development and Engineering Center. p. 27. Retrieved 5 October 2012. Overall, in a woodland environment, the lighter coloured patterns were detected at greater distances than the darker patterns. The opposite was found in desert and urban conditions. These data confirm intuition on environment-specific patterns: woodland patterns perform best in woodland environments, and desert patterns perform best in desert environments. US Army. FM 21-76 US ARMY SURVIVAL MANUAL (PDF). U.S. Department of the Army. Retrieved 23 June 2016. War Department. Field Manual: FM 5-20A: Camouflage of Individuals and Infantry Weapons. United States War Department. Retrieved 8 January 2013. Warhol, Andy (1986). "Camouflage Self-portrait". Philadelphia Museum of Art. Retrieved 1 December 2011. Zimmerman, Stan (2000). "Silence Makes Perfect". 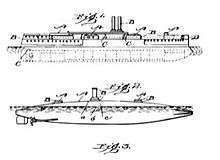 Submarine Technology for the 21st Century (2nd ed.). Victoria, British Columbia: Trafford Publishing. pp. 103–105. ISBN 978-1-55212-330-0. Wikimedia Commons has media related to Military camouflage.